My interest in pomegranate started not very long ago when I tried them out in Cyprus. I did not fall in love at first bite… It is such a piece of work to get the seeds out and frankly this granular texture was not my thing. Pomegranate is a big thing in Cyprus. I have seen nice pieces of jewelry with pomegranates design as well as house ornaments. 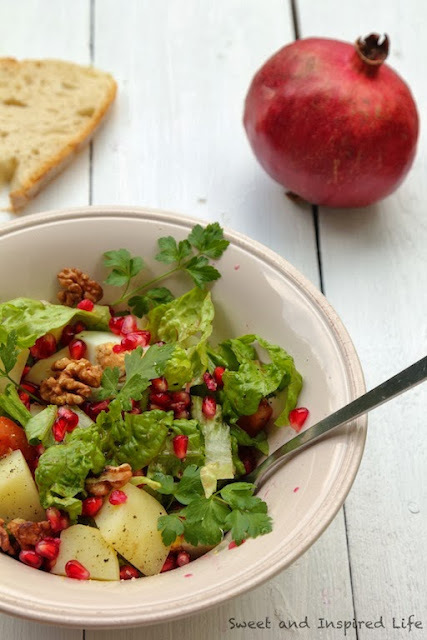 With its numerous seeds, pomegrante symbolizes fruitfulness, abundance and good luck… Some think that pomegranate was the forbidden fruit in the Garden of Eden… Why not?... The origin of the word pomegranate derives from Medieval Latin pomum granatum, literally « apple with many seeds ». 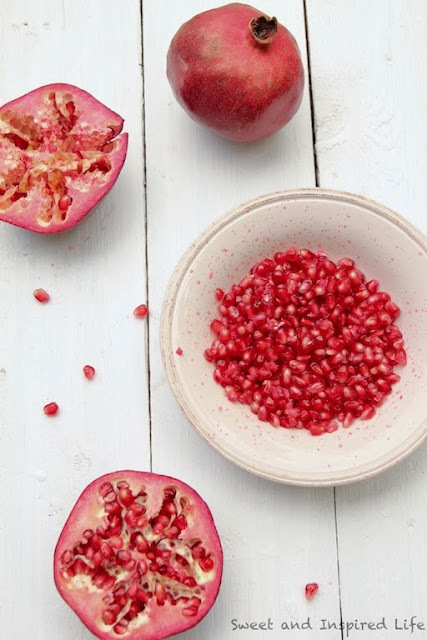 This winter fruit has great health benefits so I tried again, and again… Eventually, I found out the well-known secret to deseed pomegranate, and I started to enjoy those beautiful rubis… I love the color of the Pomegranate ! Cut the pomegranate into two horizontally. Hold one half over a bowl, with the cut side against your palm, and use the back of a wooden spoon to gently but firmly knock on the pomegranate skin. The seeds start coming out and fall through your fingers into the bowl. Then sift through the seeds to remove any bits of white skin. I wish you a very special and unique Holidays ! © 2012-2019 Sweet And Inspired Life. All rights reserved. Picture Window theme. Powered by Blogger.